Targeting the tumour vasculature is a powerful therapeutic approach, as destruction of a single vessel can potentially kill thousands of tumour cells dependent upon it for their supply of nutrients. DMXAA is a vascular disrupting agent that was developed at the ACSRC and is currently in phase III clinical trials. In addition to its direct effects on the tumour vascular endothelial cells (1,2), work by our team showed that DMXAA activated both the cancer and the stromal cells to produce a panel of cytokines within the tumour (3,4). These cytokines led to a subsequent increase in anti-tumour immune responses (5,6), and alterations in the stromal cell infiltrate (6,7). Current efforts by our group are directed at identifying the signalling pathway(s) and molecular target(s) involved in cytokine induction by DMXAA. Results to date indicate that the molecular mode of action of DMXAA is complex and involves multiple pathways and targets. There is evidence for the involvement of NF-kB (8,9), and the TBK1-IRF-3 signalling axis (10). Using a signalomics approach to screen for changes in phosphorylation status of key signalling molecules, DMXAA was found to inhibit phosphorylation of two translational regulators, eIF4E and S6 kinase with resultant affects on protein translation in lymphoid cells (11). Using an azido-analogue of DMXAA (12) in a photoaffinity labelling approach to identify its receptor(s), oxidisable proteins were found to be preferentially labelled (13). This observation has led to our current working hypothesis that DMXAA may be acting through modulation of redox signalling. 1. Ching, L-M., Cao Z., Kieda, C., Zwain, S., Jameson, M.B. and Baguley, B.C. Induction of endothelial cell apoptosis by the antivascular agent 5,6-dimethylxanthenone-4-acetic acid. Br. J. Cancer ,86, 1937-1942, 2002. 2. Ching, L-M., Zwain, S, Baguley, B. C. Relationship between tumour endothelial cell apoptosis and tumour blood flow shutdown following treatment with the antivascular agent DMXAA in mice. Br J Cancer, 90, 906-910, 2004. 3. Joseph, W.R., Cao, Z., mountjoy, K.G., Marshall, E.S., Baguley, B.C., Ching, L.-M. Stimulation of tumors to synthesize tumor necrosis factor-alpha in situ using 5,6-dimethylxanthenone-4-acetic acid: a novel approach to cancer therapy. 'Cancer Res 59, 633-638, 1999. 4. Ching, L-M., Goldsmith, D., Joseph, W.R., Korner, H., Sedgewick, J.D., Baguley, B.C. 'Induction of intratumoral tumor necrosis factor (TNF) synthesis and hemorrhagic necrosis by 5,6-dimethylxanthenone-4-acetic acid (DMXAA) in TNF knockout mice.' Cancer Res 59, 3304-3307, 1999. 5. Jassar, A.S., Suzuki, E., Kapoor, V., Sun, J., Silverberg, M.B., Cheung, L., Burdick, M.D., Streiter, R.M., Ching, L-M., Kaiser, L.R., Albelda, S.M. 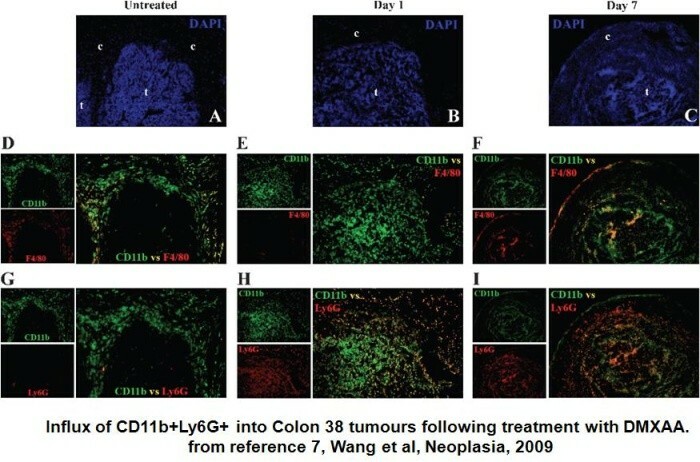 Activation of tumor-associated macrophages by the vascular disrupting agent 5,6 dimethylxanthenone-4-acetic acid (DMXAA) induces an effective CD8+ T-cell-mediated anti-tumor immune response in immunogenic and non-immunogenic murine models of lung cancer and mesothelioma. Cancer Res 65, 11752-11761, 2005. 6. Wallace, A, LaRosa, DF, Kapoor, V, Sun, J, Cheng, GJ, Jassar, A, Blouin, A, Ching, L-M, Albelda, SM. The vascular disrupting agent 5,6-dimethylxanthenone-4-acetic acid (DMXAA), directly activates dendritic cells through a MyD88-independent mechanism and generates anti-tumor cytotoxic T-lymphocytes. Cancer Res, 67, 7011-7019, 2007. 7. Wang, L-CS, Thomsen, L, Sutherland, R, Reddy, C, Tijono, S, Chen, C-JJ, Angel, KE, Dunbar, PR, Ching L-M. Neutrophil influx and chemokine production during the early phases of the anti-tumor response to the vascular disrupting agent DMXAA (ASA404). Neoplasia, 11, 793-803, 2009. 8. Woon, S-T, Zwain, S, Schooltink, M. A., Newth, A. L., Baguley, B. C., Ching, L-M. NF-B activation in vivo in both host and tumour cells by the antivascular agent, 5,6-dimethylxanthenone-4-acetic acid (DMXAA), Eur J Cancer, 39, 1176-1183, 2003. 9. Wang, L-C.S., Woon S-T., Baguley, B.C., Ching, L-M. Inhibition of DMXAA-induced tumor necrosis factor production in murine splenocyte cultures by NF-B inhibitors. Oncology Research/Anti-cancer Drug Design, 16, 1-14, 2006. 10. Roberts, ZJ, Goutagny, N, Perera, P-Y, Fitzgerald, KA, Kato, H, Kumar, H, Kawai, T, Akira, S, Savan, R, van Echo D, Young, HA, Ching, L-M, Vogel, SN. The Chemotherapeutic agent 5,6-dimethylxanthenone-4-acetic acid, potently and specifically activates the TBK1-IRF-3 signalling axis. J Exp Med 204, 1559-1569, 2007. 12. Palmer, BD, Henare, K, Woon, ST, Sutherland, R, Reddy, C, Wang, LC, Kieda, C, Ching, L-M. Synthesis and biological activity of azido analogues of 5,6-dimethylxanthenone-4-acetic acid for use in photoaffinity labeling. J Med Chem, 50, 3757-3764, 2007.